Made with only 5 ingredients and 10 minutes of prep this dump and bake philly cheesesteak makes quick and easy dinner everyone will love! Preheat oven to 350F (180C). Spray a 13 x 9-inch baking dish with cooking spray. Remove biscuits from can and cut each biscuit into quarters. In the prepared dish (or in a large separate bowl), stir together chopped biscuits, chopped meatballs, diced onion, diced bell peppers, and 1 cup of cheddar cheese. Cover with foil. Bake, covered, for 15 minutes. Sprinkle remaining 1 cup of cheese on top, and return to the oven (uncovered) for 15-20 more minutes, or until cheese is melted and biscuits are golden brown and no longer doughy inside. Cooking for a Smaller Family? Just cut the ingredients in half and bake the casserole in an 8-inch square baking dish. You can even purchase mini cans of biscuit dough so that you don't have to waste any. Want to Prep Ahead? 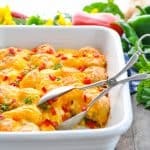 You can assemble the casserole and keep it covered in the refrigerator or frozen until ready to bake.